MSNBC: The Official Election Night Network for Democrats? It looks like MSNBC and Chris Matthews hit their target "demographic" of liberal Democrats on Election Night. On last night's Hardball, MSNBC's Chris Matthews revealed his friend at the Democratic Party headquarters told him MSNBC was "on all night there." Matthews then proudly exclaimed: "That is great news in terms of us reaching the important demographics, of course." NBC News producer Mike Viquiera, who was at the party, said they rotated "between two of the three cable networks and I'm not gonna tell you which of the third networks that they didn't rotate to." 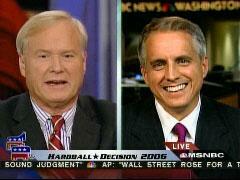 To which Matthews asserted: "I think we're probably the one in the middle...politically." Chris Matthews: "NBC News congressional producer Mike Viqueira watched the election results come in last night from the Democratic Party's election headquarters. Mike, was it you that was controlling the TV last night? Because I thought it was so great. I talked to a friend of mine Smith Bagley today he said he was over there, Elizabeth Bagley his wife, they're contributors and supporters of the Democratic Party, they told me that we were on all night there. That is great news in terms of us reaching the important demographics, of course." Mike Viqueira: "You know I'm compelled to tell you the God's honest truth Chris. There was another cable network, that will go unnamed, that was on for a while and I called up, called over one of the aides who was working, had been sort of dragooned from Capitol Hill to come over and, and assist with this party and I said could you at least put one of the televisions on MSNBC. And they came back and said that they were going to rotate between two of the three cable networks and I'm not gonna tell you which of the third networks that they didn't rotate to. But that was the story and that`s how that turned out." Matthews: "I think we're probably the one in the middle, but let me ask you, politically."